Before the recession smashed the record, long-term unemployment peaked at 26 percent thirty years ago. 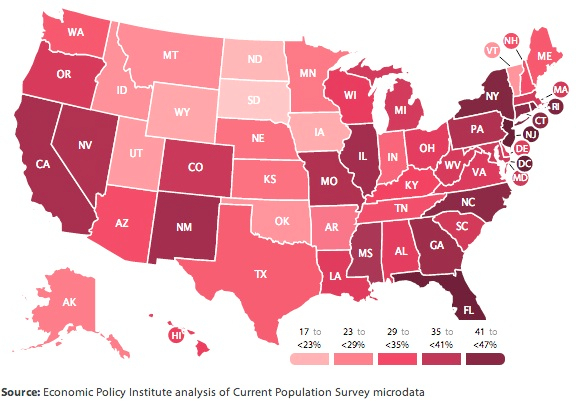 But in 2013 it was higher than that in 41 states and D.C. It’s highest in D.C., New Jersey and Florida, where more than 45 percent of the jobless are long-term unemployed (i.e. unable to find work after about six months of looking). There is no more serious an indictment of the current economic system than the number of unemployed workers, especially long-term unemployed workers. According to the Bureau of Labor Statistics, as of July of this year, 11.5 million workers remain jobless, of which 37 percent (or 4.3 million) have been without a job for 27 weeks or more. 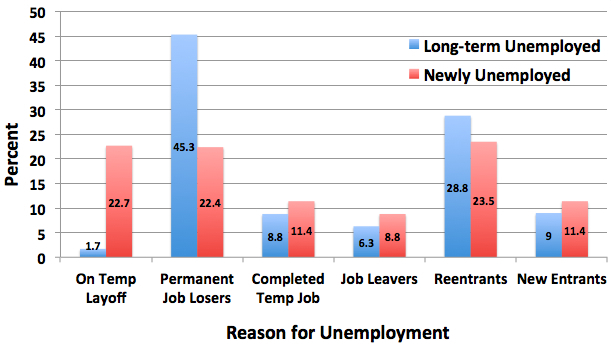 So, who are the long-term unemployed? As it turns out, they’re not much different from newly unemployed and discouraged workers in terms of education, race, or gender. But they do tend to be older than the other groups (e.g., most of the newly unemployed are 25 years old or younger, while the long-term unemployed are pretty evenly distributed among age groups) and, as you can see in the chart above, the largest group among the long-term unemployed is made up of those who were laid off. In other words, people who did nothing wrong other than working for companies that decided to fire people during the Second Great Depression will likely never find another decent job. If the number of long-term unemployed represents an indictment of the economy, the fact that they have fall out of sight is just as much an indictment of the current political system.